Get carried away to a place of pure bliss as you pamper your hands and delight your senses. This lush scent features juicy pomegranate – a globally loved fruit with gem-like seeds cultivated since ancient times – blended with a fruity medley of wild berries, apples, pears and passion fruit. Your carefree getaway is waiting. Find your bliss today. Created to deliver an extra dose of indulgence, the limited-edition† Blissful Pomegranate Satin Hands® Pampering Set transports you to a soothing retreat in three easy steps. Step 1: Protect and Prepare – The fragrance-free Satin Hands® Protecting Softener helps support the skin barrier, sealing in precious moisture. It moisturizes and protects skin. And prepares hands for a stimulating spa experience. Massage into hands before using the Satin Smoothie® Refining Shea Scrub. 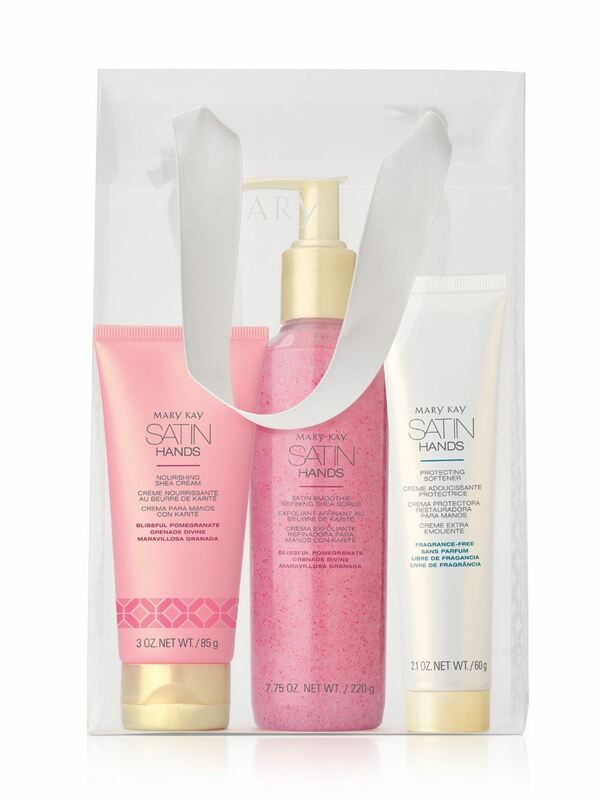 Step 3: Nourish and Soothe – Pamper hands with the creamy comfort of Satin Hands® Nourishing Shea Cream. It not only wraps skin in instant hydration, but it also is clinically shown to moisturize for 24 hours.†† Feel dryness disappear as this shea butter-infused cream instantly melts into skin and leaves hands feeling soft and noticeably smoother. Hands feel soothed and continue to feel moisturized after washing. Nine out of 10 women said their hands felt soft, smooth and revitalized! * Satin Smoothie® Refining Shea Scrub gently yet effectively exfoliates skin, polishing away dull and dry areas. 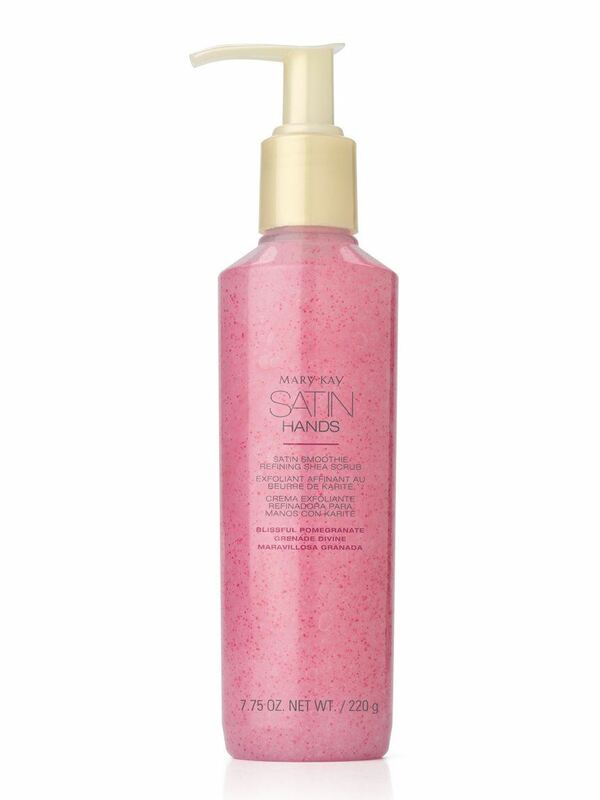 Hands instantly look healthier after one application, and with daily use, they look rejuvenated and revitalized. Blended with luscious shea butter, this scrub instantly reveals noticeably smoother-looking skin as it buffs away dirt and impurities and leaves hands feeling softer. Clinically shown to moisturize skin for 24 hours.†† Pamper hands with the creamy comfort of Satin Hands® Nourishing Shea Cream. It not only wraps skin in instant hydration, but it also leaves hands moisturized all day. Feel dryness disappear as this shea butter-infused cream instantly melts into skin and leaves hands feeling soft and noticeably smoother. Hands feel soothed and continue to feel moisturized even after washing.